This is a fun project and a good way to use up small amounts of yarn. Just follow the easy steps below for knitting a color-graded hat. 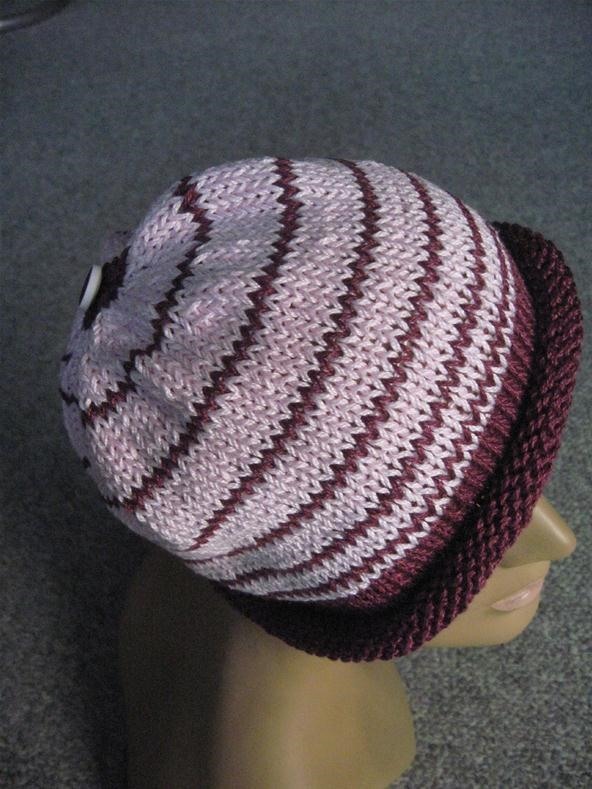 Cast on the number of stitches you need for your hat on a circular needle using Color A.
Knit for 10 rows for a rolled edge or k2p2 for a ribbed edge with Color A.
Knit 1 row Color B.
Knit 1 row Color A.
Knit 2 rows Color B.
Knit 3 rows Color B. Continue in this manor always knitting one row of Color A, while adding one row of Color B as you continue up the hat. When you get to the last few rows of the hat end with Color A to match the bottom. Sew a button or a pom pom or tassel on the top or just leave it plain. Be sure to remember to do your decreases as called for. Watch this video for a video explanation of the color graded hat.